Two lifers yesterday! Dance a jig! Great looks! Beautiful birds! Six of us took off from Patzcuaro for a Sunday birding trip. At the first stop outside of Opongio, on the road up to Santa Juana, we got good looks at the Mountain Trogon. There were a number of other nice birds. South of Tacambaro, Rio Corucha was not as productive as usual. Arroyo Frio gave me "eyefuls" of two lifers. Can't beat that. 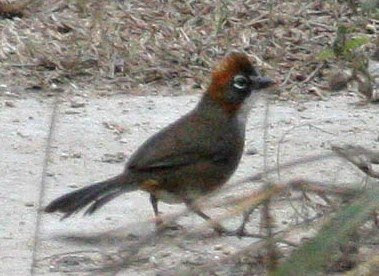 The Rusty-crowned Ground-sparrow is endemic to western and southwestern Mexico. 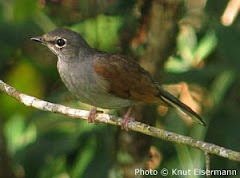 The species occurs both in the Sierra Madre Occidental range, and the Cordillera Neovolcanica mountain belt. The Banded Wren is a beautiful bird--but then, aren't they all. We had lunch in Tacambaro, and then visited a gifted local artist to see linocut and woodblock prints. That was a special treat. There were Georgia, Thomas, Tracy, Glen, Steve and Janet. Once again, viva the Patzcuaro Birding Club.